The Model H312KIT 12" Plastic Enclosure, Includes Cover provides grid mounting space for Linear structured wiring components. 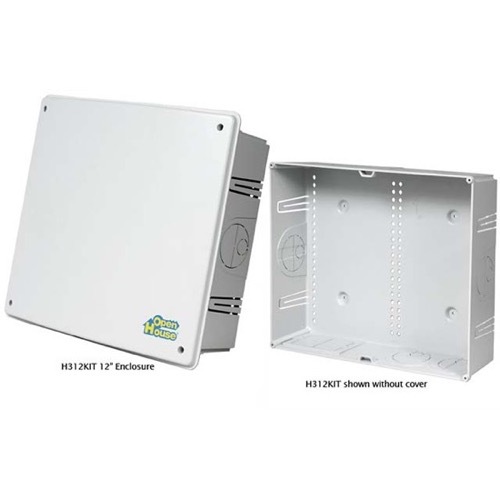 The enclosure is ETL Listed and features 19 grid inches of mounting capacity in two 9-1/2" columns. Structured wiring modules snap securely into the enclosure's mounting grid. Recommended enclosure for the M&S Systems DMC-10H Structured Wire Intercom Hub. The enclosure mounts in the wall between standard 16-inch spaced studs, or it can be surface mounted. The flexi-mount system features four flexible mounting tabs on the sides of the enclosure. The flexi-mount tabs compensate for varying stud spacing and allow for adjusting the depth of the cabinet for flush-mounting with all thicknesses of drywall. A snap-on cover that can be screwed shut is supplied with the enclosure. The vented cover has a raised interior, allowing for easy wiring and better component cooling. Eight combination conduit knockouts (four along the top, two on the bottom, and one on each side) that fit either 2" or 1/2" conduit fittings are provided. The enclosure has an additional knockout on the bottom to mount a single-gang junction box for AC outlet installation.